Does this Government Care About Middle Class Families? The CPS use a simple not atypical example of a married man with two children, who has no savings or investment income, and no student loans. Factoring in allowances and changes to child benefit, his marginal rates will be as above. 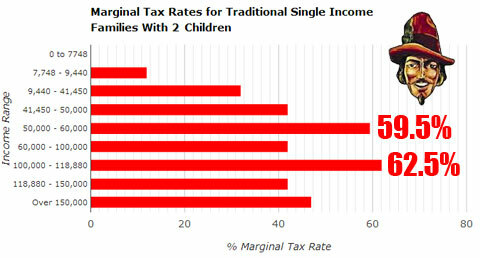 A middle-class single income family with 2 children and the father earning £50,001 will have a marginal tax rate of 59.5%. You don’t have to be a fully paid-up member of the Taxpayers’ Alliance to think that is far too much.